This is not the sitcom-version you remember--hail Satan. 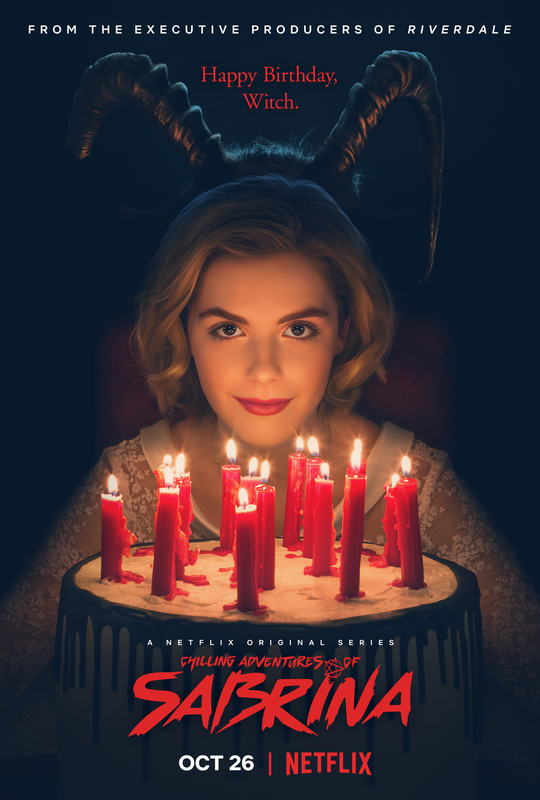 One of the big surprises of 2018 came from the Netflix show The Chilling Adventures of Sabrina. I watched it on a whim one night after a hard day of PhD-ing and ended up binging it. Since then, I’ve championed the series to different folks. If you like family dramas, witches, Appalachian gothic, or smashing the patriarchy, I’d give it a watch. On the week of her sixteenth birthday, Sabrina Spellman (Kiernan Shipka) seems like your average high school student at Greendale. She likes to watch classic horror movies with her friends, she is in love with her boyfriend Harvey (Ross Lynch), and she wants to start a new club to support young women facing harassment. But as soon as she steps into her home—also a mortuary—she becomes Sabrina Spellman, half-witch. Raised by her aunts Zelda and Hilda (played by Miranda Otto and Lucy Davis) and her warlock cousin Ambrose (Chance Perdomo), Sabrina is about to become initiated into the Church of Night and leave her high school behind to study magic. Part of becoming a witch on the night of her sixteenth birthday is cutting ties with her mortal friends, but Sabrina struggles with the idea of leaving behind her friends to serve the Dark Lord. As Halloween and her birthday approaches, Sabrina must decide between her friends and her family heritage. This decision propels the remaining episodes of the series, which expands into the world’s lore and Sabrina’s heritage as a witch. I don’t want to give too much away because the expanding world was a delightful aspect of the series. While the show focuses on Sabrina and her friends (and is YA appropriate in terms of low sexual content and profanity, though at times very violent), I’d encourage anyone to watch it, particularly for fans of Harry Potter or SyFy’s The Magicians. In addition to balancing the magical aspects of the show, multiple episodes explore issues of feminism, smashing the patriarchy, race, sexual orientation, disability, and bullying. Through Sabrina, these becomes issues of her world rather than political statements. While TV shows at times have issue-driven episodes that seem to be responding to the political climate of the previous six months, The Chilling Adventures of Sabrina focuses on the lives of the characters, and since this is part of their lives, of course Sabrina is going to help them. That being said, especially early in the season, it at times felt a little white-savior as Sabrina works behind the scenes with magic to help her friends. Overall, Sabrina was a big surprise in 2018. I fell in love with the show and look forward to future seasons. For those still stuck on Salem the puppet cat from the sitcom, this reboot is far from Sabrina the Teenaged Witch, but as of now, the reboot seems timely. Bonuses: +1 for all the supportive friendships trying to smash the patriarchy, +1 for not appropriate witch-y magic. Penalties: -1 for some weird special effects in the first few episodes. Nerd Coefficient: 8/10 “Well worth your time and attention.” Read more about our scoring system here.